The new Citroen C1 Airscape Hatchback is a city car that is stylish, doesn’t cost much to run, and comes with plenty of appealing standard equipment. It isn’t quite up to the standard set by the class leaders, but there is still a lot to like. The Airscape is the range-topper in the C1 range. 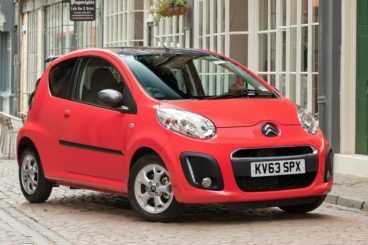 Like the rest of the C1, it’s the smallest car in Citroen’s current line-up. Sharing its engine and platform with the Peugeot 108 and the Toyota Aygo, it still manages to retain its typically unique Citroen (and French) styling. There are also lots of personalisation options on offer to make it as unique as possible, while purchase price is relatively low. OSV takes a closer look at what it’s all about with our Citroen C1 Airscape Hatchback review. Despite being a range-topping model, the Airscape still relies on the same underpinnings as the outgoing model, which is something of a disappointment. The suspension is soft and comfortable enough, but there is too much body lean in bends. As such, the Airscape is not as fun to drive as some of its rivals in this sector, including the Skoda Citigo. The steering is at least light, though, which makes it an ideal city car, but there it doesn’t give you much confidence in corners. There are no diesel engines to choose from, which means the choice is limited to just a pair of petrols – a basic 1.0-litre unit and a more powerful 1.2-litre unit. The latter is not the same engine that powered the original C1, but it is based on it. This means you get the same distinctive thrum, but you’re not going to mind working it too much. And work it hard you must if you want to keep up with traffic and make good ground. The engine isn’t exactly what you could call sprightly, and takes 14.3 seconds to get from rest to 62mph. And while it’s an engine that can be enjoyed when you’re out and about in town, it isn’t going to offer the same kind of enjoyment out on the motorway. Eventually, its noise will likely wear you down. It makes a lot of sense to pair the Airscape up with the more powerful 1.2-litre engine, which will cost you a bit more money. It has a bit more oomph, and is a much quieter cruiser when you’re on the motorway. It develops an extra 13bhp over the 1.0-litre unit, which is significant in a car as light as this. It also covers the 0-62mph dash much quicker, taking just 11.0 seconds. It’s more flexible, too, and offers better turn of speed. The 1.0-litre engine can be matched up with an automated manual ‘box. The advantage of this is that you don’t have to operate a clutch pedal. However, it worsens both performance and economy. Moreover, it isn’t the most pleasant to use; OSV found it too jerky and clunky. We recommended sticking with the standard manual transmission. You have to enter the C1 Hatchback via a tinny door, which means you’ve already got off to a bad start. Once you’re inside and seated, it won’t take you long to cast your eyes over the cheap-looking and cheap-feeling plastics that “adorn” this interior. Nothing looks particularly robust and durable. The good news is that, while getting comfortable in the entry-level model is difficult, getting comfortable in this range-topping C1 Airscape is a lot easier. Unlike the basic version, the Airscape comes with a height-adjustable driver’s seat that makes it simple to get into a driving position that is comfortable for you. Unfortunately, no versions offer an adjustable steering wheel. The car’s soft suspension offers plenty of rewards in city traffic, where it absorbs the bumps and lumps in our worst road surfaces. It’s not as comfortable as some rivals in this sector, but a quick test drive might leave you feeling satisfied. But where the car doesn’t fare too well is motorway refinement. It’s better than the model it replaces, but it’s not as subdued as we (or you) would prefer once you get up to speed on the motorway. The dashboard is also a bit of a disappointment because it just doesn’t feel all that well-built. There are lots of coloured plastics that look nice enough, but the quality is down. It’s okay, and that’s about the best we can really say about it. The dash is also a bit too cluttered, and would benefit from being simplified. Interior space is good up front for the driver and passenger, but it’s less impressive in the rear. There is both a three-door and a five-door version available, and while the latter is a bit more practically, the rear doors still don’t open wide enough to allow for easy access. 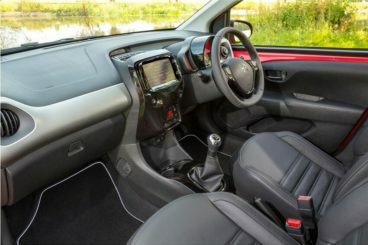 Up front, the C1 can easily match its rivals when it comes to interior room. But it’s in the rear where it falls down. Citroen have made things even worse by introducing pop-out windows that give the rear seats a claustrophobic atmosphere – an enhanced claustrophobic atmosphere. During longer journeys on hot days without any air conditioning, sitting in the rear is not going to be a pleasant day out. However, the Airscape model does at least come with a full-length retractable roof that feels the car with air. Storage spaces are good, and there are plenty of cup holders, door pockets and a sizeable glovebox for your various odds and ends. The boot is bigger than last time around, but at 196-litres it’s still far from being competitive in this class. It comes with a usefully wide opening but doesn’t come with a false floor. The Airscape has a unique selling point in the form of its roof. A roll-back fabric top, it lets you soak up fresh-air driving during the warmer months. It comes as standard with this model, but can also be specified with the Flair or Feel trims for an extra £1,000. Other equipment that you get as standard includes 15” alloys, body-coloured door mirrors, tinted rear windows, a rear-view parking camera, a reversing camera and a rear diffuser. Prices for the range-topping Airscape model go as high as £12,550. The exact model is the Airscape Flair VTi 68 ETG five-door 5dr. If you want to lease the car over three years, you’d be looking at paying as much as £150 + VAT per month. Although there is no diesel offered, the two petrol engines are very efficient and don’t cost much to run. This is important in the city car sector, where you don’t want to be splashing out a small fortune on your daily commutes to and from the office. For comparisons sake, the VTi 68 S&S model is the cheapest to run in the whole C1 range and can achieve impressive returns of around 74.3mpg while emitting just 88g/km of CO2. This means it doesn’t cost a dime to tax. In fact, even this range-topping Airscape C1 hatchback is free from road tax, too. Opt for the more powerful 1.2-litre petrol engine and you can achieve average returns of 65.7mpg. It isn’t really a good idea to pair up the 1.0-litre petrol engine with the automated manual transmission, as this will have a dampening effect on running costs. It’s much cheaper to just stick to the standard gearbox. 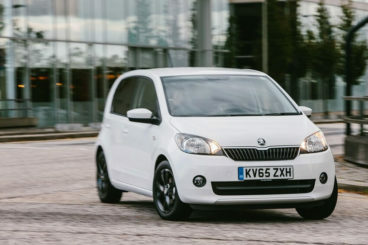 The car isn’t particularly expensive to insure, but it will cost more than some of its closest rivals, such as the Skoda Citigo. The 1.0-litre petrol unit is dirt cheap to insure and occupies insurance group three, while the more powerful 1.2-litre unit occupies group 7. A typical three year/60,000 mile warranty comes with the C1. This is the smallest car that Citroen currently produce, but the design team have got the best out of its small dimensions. Although they haven’t had much to work with, they’ve created a dinky city car that is funky and cheerful. Happy days. There are three trim levels to choose from, and while the entry-level C1 hatch is very basic, this Airscape variant gets you a folding fabric roof, 15” alloys, a chrome window, tinted rear windows, heated, electrically adjustable wing mirrors, and air conditioning. All engines are exempt from road tax, while the cheapest engine in the range can achieve mighty impressive returns of 74.3mpg. You’re going to be put through the proverbial ringer if you spend too much time on the road in this car. There is a constant distinctive thrum that might eventually grind your gears, and which isn’t particularly pleasant. Fill this car up with four adults and you’re going to feel the pinch. Fill it up with five, and you might not make it out in one peace. Rear seat space is especially cramped, with the bizarre pop-out windows serving to give the illusion of even less space. The city car sector is awash with quality right now. 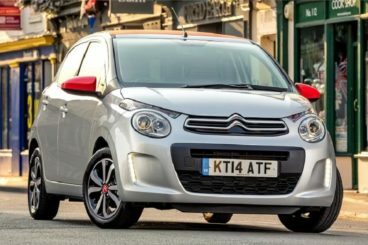 Let’s see how this one fares against its rivals in the comparison section of our Citroen C1 Airscape Hatchback review. The Skoda Citigo has at last grown up. Despite developing into a mature city car, it still knows how to have fun on the road. If you’re looking for a car to keep you in good company while you potter about in the city, this Skoda has got your back. It can negotiate tight streets with easy, and is simple enough to park. There are no diesel engines available, which means the choice is restricted to a pair of 1.0-litre petrol engines – a 59bhp and a 74bhp variant. The former takes 14.4 seconds to get from rest to 62mph, while the latter covers the same ground in 13.2 seconds. Both engines actually feel the same, though. You won’t need to spend much time at the fuel pumps with the Citigo. The 59bhp 1.0-litre GreenTech engine can achieve returns of 68.9mpg while costing you nothing at all in road tax, and it also offers minimal BiK. The 74bhp 1.0-litre petrol unit is good for fuel economy returns of 67mpg and is also free from road tax. If you want the non-GreenTech 58bhp variant, you will have to pay £20 each year in road tax. The Skoda Citigo has a far superior interior than the Citroen. Indeed, if you test drive the Skoda followed by the C1, you will notice the difference instantly. The dash is plain but unlike the one in the Airscape, it’s well assembled. And despite its modest dimensions, the Skoda is actually a rather spacious city car. It offers more rear legroom than the C1, as well as a bigger boot. Indeed, measuring 251-litres, this boot is almost the biggest in the whole class. It also comes with a false floor, something the C1 hatchback misses out on. The Hyundai i10 hatchback has got all the equipment to emerge as a class-leader, which is quite a statement when you consider how far behind the competition Hyundai used to be. The suspension here is a bit rigid, but not everyone is going to see that as a drawback. In and around town the buzzes around comfortably enough, with its good visibility and high driving position aiding your enjoyment. It’s also a very agile handler. Like the Citroen, the Hyundai i10 doesn’t offer any diesel engines. The means you’re left with a choice or two engines, both of which feel a bit zippier than the numbers suggest. On paper, the entry-level 1.0-litre unit takes 14.9 seconds to get from rest to 62mph, while the more powerful 1.2-litre 86bhp engine covers the same stretch in 12.3 seconds. 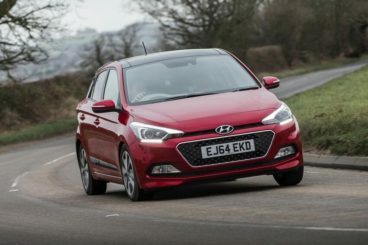 The Hyundai is cheaper to insure than the C1, which will appeal to younger or more inexperienced drivers. Running costs are also fairly low, with the 1.0-litre unit good for returns of around 60.1mpg while costing just £20 per year in tax. If you opt for the more powerful 1.2-litre petrol engine, fuel economy drops slightly to 57.6mpg, while your annual road tax bill will rise to £30. Hyundai’s interiors are now a lot better than they ever were. The dash is smartly designed and well built, and overall the materials in the cabin are impressive. You can choose from an array of bright colours to cheer up your dashboard, inkling orange beige, red metallic, or bright blue. Although they won’t be for everyone, these colours add more character to the cabin than the dull plastics in the C1. Interior space is also better in the Hyundai, with enough rear legroom to make even longer journeys adequately comfortable. Visibility is good, parking is easy, and the 252-litre boot is class-leading. If you fold the rear seats, you can extend this space to 1,046-litres. It isn’t the most usable boot, however, thanks to a high boot lip and the fact that you can’t lie your items flush with the boot floor. If first impressions are everything, this car is going to appeal to lots of people. It’s funky, fresh and cheerful styling gives the car bags of personality, which is exactly what a city car needs. Inside, contrasting colour options keep the feel-good factor going, and the car is good fun to drive in and about the city. The Citroen C1 Airscape Hatchback is fun, chic, adorable – and affordable.